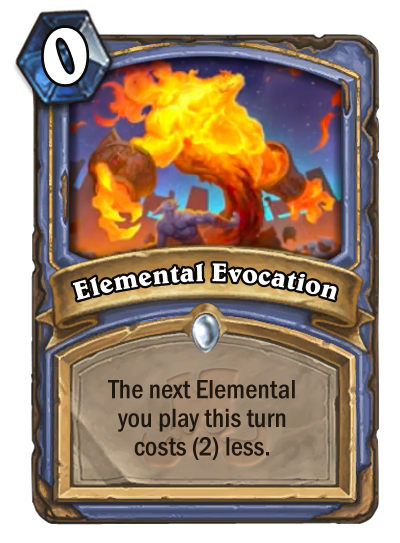 Rastakhan's Rumble card reveals continue with a new Mage spell Elemental Evocation, revealed by Deela. One of the issues I found whilst trying various elemental mage decks was that you often get stuck with lots of cards in hand but no way to play them fast enough. So sacrificing some card advantage for tempo could be handy. Means the elemental dusk breaker can now be played on turn 4 too. And can help you continue your elemental chain, e.g. if you have 6-mana and just two Blazecallers). Horrific pull from random find a spell effects if you’re not playing elementals though. not a bad pull for quest mage, 0 mana +1 quest progress.